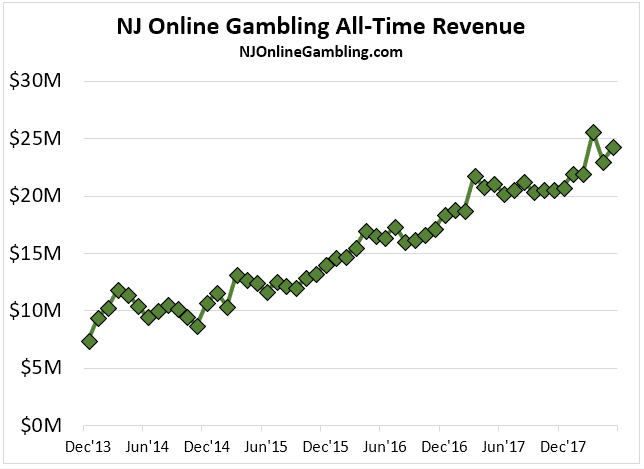 There is perhaps no better indicator of the NJ online gambling industry’s trajectory than the revenue figures that are released monthly by the NJ Division of Gaming Enforcement. We have compiled those figures dating back to the industry’s infancy, and present them on this page, along with supplementary commentary that details recent and historical performances. 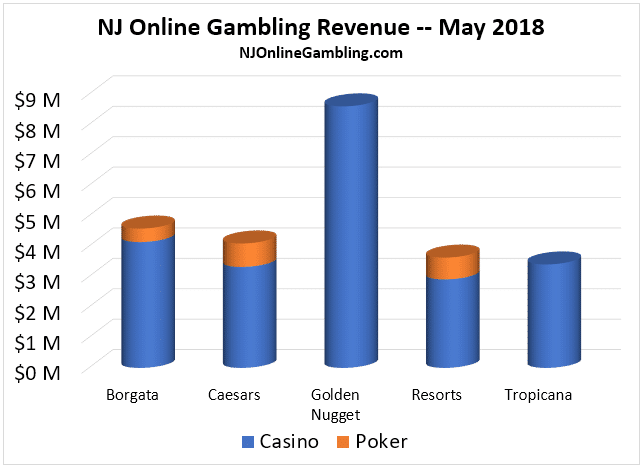 May was yet another stellar month for the NJ online gambling industry — one in which it produced its second highest revenue tally ever. Overall numbers split the difference between March’s record-breaker and last month’s total. Revenue was up 5.6% (2.2% after normalizing for April’s shorter length). Overall revenue topped $24.3 million, whereas in April it was roughly $23 million flat. Online casino operators led the charge once again with $22,372,928, up 18.1% year-on-year, and accounting for an outrageous 92.1% of industry revenue — nearly the most lopsided ratio to date. The year-on-year gains were the third smallest in industry history, which doesn’t surprise given the market’s advancing age. Overall, casino revenue was up 5.2% month-on-month. Online poker revenue ($1,929,693) was up 9.6% for the month, propelled by WSOP.com. The uptick hardly comes as a surprise, as May 1 marked the first day of shared liquidity between 888-branded sites in NJ, Nevada, and Delaware. What did surprise is that year-on-year revenue was down 9.0%, signaling that not even a somewhat historic event can turn the tide for the industry. On an individual operator basis, it was yet another terrific month for Golden Nugget, which broke $8 million for the third month in a row. 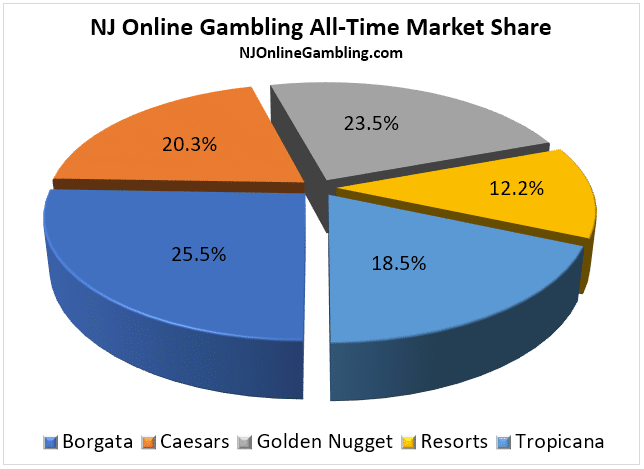 Also of note was the record setting performance of Borgata Casino and its affiliated sites, which generated more than $4.1 million in online casino revenue. The numbers for other operators were solid. Tropicana Casino revenue climbed 7.2% for the month, up to $3.4 million, and Resorts online casino revenue was up marginally (+3.4%). But it was Caesars AC that was by far the biggest mover, with online casino revenue up 8.6% and online poker revenue surging a tremendous 71.4%. As noted, May was yet another titanic month for Golden Nugget AC, whose three operators (Golden Nugget Casino, Betfair Casino, and Play SugarHouse) combined to generate an industry best $8,600,364. It was Golden Nugget’s second best month ever, only trailing its impressive March performance ($8,655,240). Part of the operator’s success is no doubt tied to its aggressiveness on the promotional front. Both Golden Nugget and Play SugarHouse hold powerhouse promos on a monthly basis, which see players win tens-of-thousands in bonus cash. In April, the Golden Nugget triumvirate saw $1,056,455 wagered on promotional plays, compared to other operators that gave away between roughly $100k – $600k. What’s remarkable about the Golden Nugget’s performance is not so much that it’s winning, but the margin of victory. The operator blew away it’s closest competitor (Borgata AC) by over $4 million, despite the latter supporting an online poker network. Golden Nugget has been atop the industry leaderboards for 24 consecutive months now, and we can’t envision a scenario where it gets usurped anytime soon. The fight for second place is more closely contested, but we have a feeling Borgata will keep pulling away, thanks primarily to the launch of the new PartyCasino NJ, its Live Dealer rollout, and the planned addition of exclusive content. 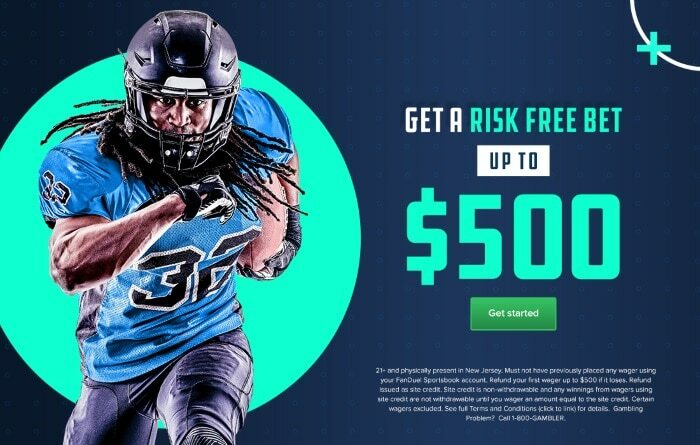 Third place belongs to Caesars, where it should remain for at least the next few months, thanks to the hype and strong promotional rollouts associated with its online poker properties. At 35.4% market share, Golden Nugget AC holds a 16.5% lead over the closest competitor. Due to its otherworldly performance in May, it saw its market share increase by more than 1% percent. 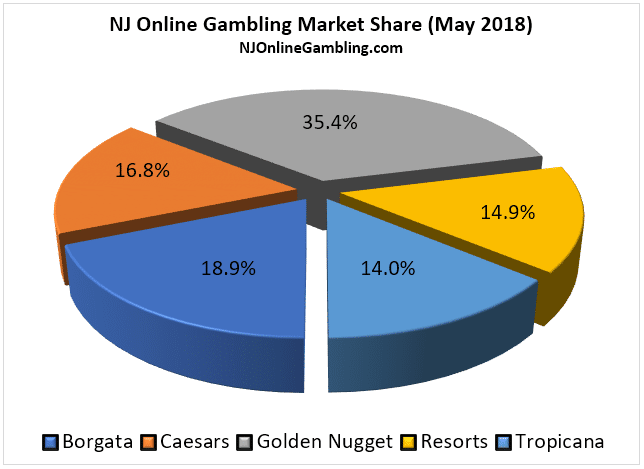 The NJ online gambling industry has now generated $826 million in gross gaming revenue since flipping over the open sign four-and-a-half years ago, with over $261 million of that total coming in the past 12 months alone. 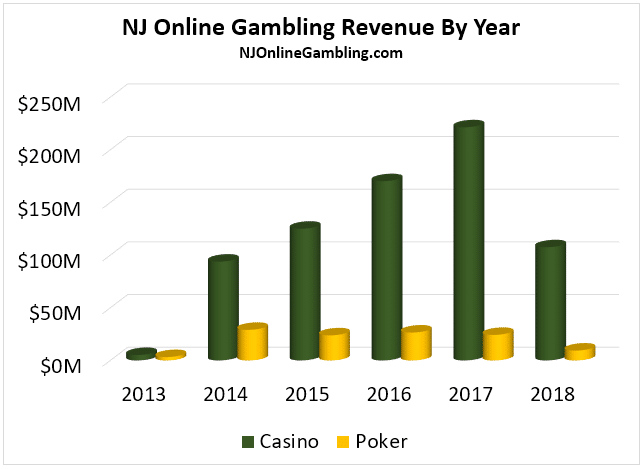 The first five months of 2018 see the NJ online gambling industry firmly on pace to break the record of $245,605,981 set in 2017, which itself represented a 24.9% uptick over 2016. So far this year, the industry has clocked $116,856,056 (~$280.4 million annual pace), with arguably its best months still ahead. Operators have now paid nearly $146.9 million to NJ state coffers, with more than $45.7 million coming in the past 12 months. The all-time market share lead still belongs to Borgata AC, which dominated the industry revenue charts in the market’s early years. However, at the rate Golden Nugget is going, we now project that it will surpass Borgata as the lifetime market share leader by the time 2018 comes to a close. Already, the giant has caught Tropicana, and it surpassed Caesars last November. This changing of the guard is highly significant, as its lends credence to the idea that smaller land-based brands can beat out industry giants in the online space. It’s at least something smaller casinos in other states will want to consider as they ramp up their iGaming lobbying efforts. Both Hard Rock Casino and Ocean Resort Casino are expected to open on June 28. The openings will likely be paired with the launch of online casinos. WSOP/888 in New Jersey have combined their player pools with 888-powered sites in Nevada and Delaware. This is particularly significant, because the live World Series, and the influx of poker tourism that comes with it, is in full swing. 888 is planning on launching Live Dealer games shortly. The format has proven a boon for other operators. Mobile casino apps will continue to improve, and operators will grow even more in tune with their patrons’ wish lists. 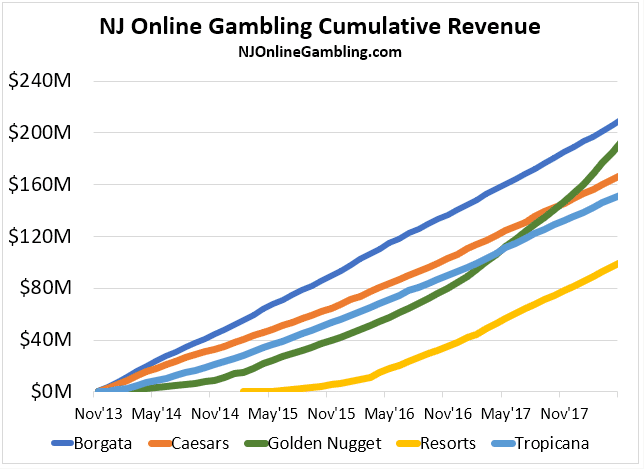 All three Golden Nugget AC properties are trending positive, and there’s no reason to believe that trend will reverse anytime soon. If anything, it appears to be accelerating. The addition of more Live Dealer games will continue to drive growth. In any case, the recent performance of the market should finally put to rest any doubts over its viability.